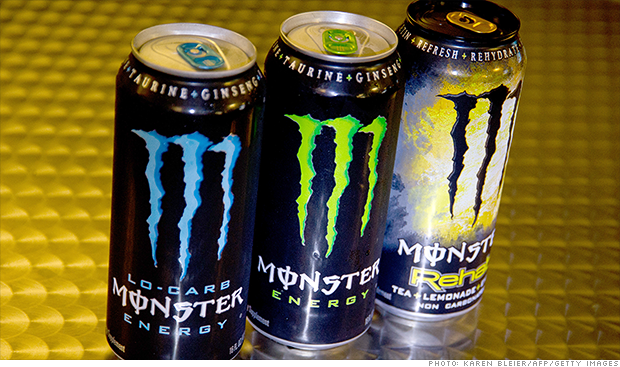 Shares of the energy drink maker Monster Beverage were in need of a jolt Thursday. Monster shares (MNST) fell 7% after the company reported a drop in first quarter earnings and weaker-than-expected sales growth. The company said late Wednesday that earnings were hurt by costs related to the termination of certain distribution agreements. It also cited expenses tied to various lawsuits against Monster. The city attorney in San Francisco, Dennis Herrera, filed a lawsuit earlier this week claiming that Monster markets highly caffeinated drinks to children, despite evidence that energy drinks can cause significant health problems for young people, including death. Monster had previously filed a complaint against Herrera's office in federal court. The Food and Drug Administration said last year that it was investigating reports from consumers that linked Monster energy drinks to five deaths. The reports were disclosed as part of a lawsuit filed by the parents of a Maryland girl who died in December from heart problems after drinking Monster Energy on two consecutive days. Monster has refuted the claims, saying its drinks are safe and contain less caffeine than conventional coffeehouse drinks. In a call Wednesday with analysts, Monster CEO Rodney Sacks called Herrera's lawsuit a "misguided crusade against the company." Meanwhile, investors were also disappointed by Monster's sales growth, which has been in the double-digits over the past few years. Gross sales rose 7.3% in the first quarter, down from 16.6% in the previous quarter. Sacks said the overall market for energy drinks has been soft, in part due to the negative publicity around their safety and marketing practices. He said sales continued to weaken in April. Analysts at Gabelli & Company lowered their rating on Monster stock to hold, pointing to slowing U.S. sales, weak overseas growth and the "constant negative media attention brought about by the recent lawsuits." Meanwhile, shares of another company in the caffeine business were on a tear. Green Mountain Coffee Roasters surged (GMCR) after the company reported strong quarterly results late Wednesday and expanded its partnership with Starbucks (SBUX). The irony was not lost on one StockTwits trader, who also noted that Tesla (TSLA) and Barnes & Noble (BKS) were big winners in early trading. $GMCR, $TSLA, $BKS having a party today... $MNST not invited. Another trader joked that hedge fund manager Bill Ackman, who has made headlines recently for betting against Herbalife (HLF), might be behind the drop in Monster shares. $MNST where is ackmen ? lol... he likes only HLF to short ? Other traders noted that there are just too many risks with the stock right now and it's time to bail. $MNST Hate to go all "Peter Lynch" but when you see huge multi-week discounting at a major store that's a red flag. Should have nailed that. $MNST I am selling out all here.It's had a good run and the negative momemntum is building up.Showing is decreasing earnings.